With apologies, technical difficulties rendered the editor rather useless for a week, but now an attempt can be made to put the last eight days into perspective. To no one's surprise the Brother Martin Crusaders crushed all competitors at the Louisiana Classic on January 16th and 17th, winning it by 122.5 points over runner-up Holy Cross. The Crusaders had seven champions (six in a row from 113-145 lbs.) in Steven Shields (113 lbs. ), Stephen Rumney (120 lbs. ), Taylor Gambill (126 lbs. ), Paul Klein (132 lbs. ), Blaine Eisensohn (138 lbs. ), Mason Williams (145 lbs.) and Yehia Riles (182 lbs.). Holy Cross had two champions in George Benoit (152 lbs.) and Brice Duhe (170 lbs.). Jesuit, which finished third, had a champion in Brody Martin at 106 lbs. The remaining champions were Brusly's Koby Mancuso (160 lbs. ), Kendrick Jones of Hahnville (195 lbs. ), Nick Simoneaux of Live Oak (220 lbs.) and a second Division III wrestler, Kirk Wilson of Dunham, at 285 lbs. Oddly enough, this was only the Crusaders' second Louisiana Classic championship in the last decade. Granted, last season they were unable to participate for medical reasons, and had they competed odds are this would be their third championship in succession, but the last time they won prior to 2013 was back in 2005 under Coach Matt Orillion. 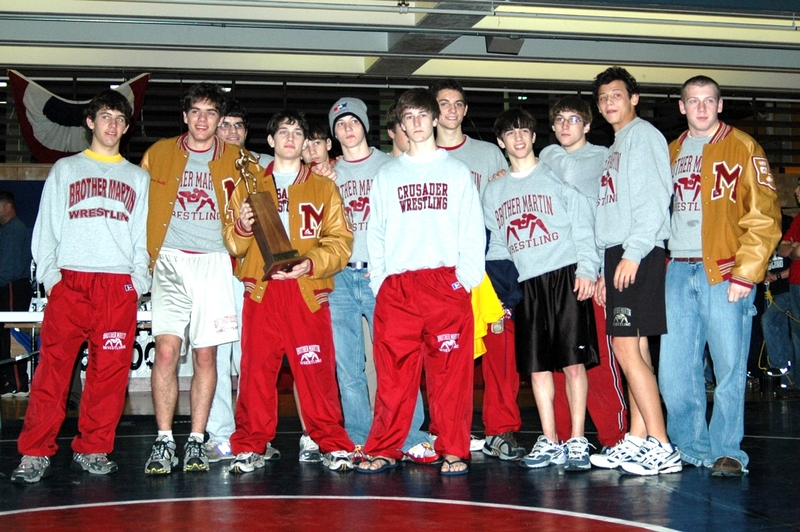 Jack Duffard, Eric Metzler and one Nick Shields, Steven Shield's older brother, were the individual Crusader champions that year. The 285 lbs. weight class is anybody's guess. Jesuit's Dominic Carmello is probably the front-runner as he has wins at the Warrior Open and the Mandeville Open, the latter of which included a finals victory over Trey Culotta winner Christian Ponson of Fontainebleau. Carmello, Ponson, Holy Cross' Travis Gardner, Catholic's Aaron Wiltz or Zachary's Chris London should emerge from the Ken Cole as the #1 seed at State. The South Plaquemines Hurricanes had five champions and walked away with the John Curtis Invitational championship on January 17th with 153 points. Winning for the Hurricanes were Correy Ancar at 126 lbs., Gerald Barthelemy at 138 lbs., Tony Sode at 145 lbs., Brandon Turner at 160 lbs. and Braxton Williamson at 195 lbs. Host John Curtis only had one champion in Brendon Wilcox (113 lbs.) yet finished second with 114 points. With only eight wrestlers Phil Bode's Episcopal Knights placed third and had three champions in freshman John Rollins (106 lbs. ), his older brother, senior David Rollins (120 lbs.) and senior Jack Bowman at 152 lbs. Fourth place Evangel had champions in Kelvin McNeil, Jr. at 220 lbs. and Vincent Hall, Jr. at 285 lbs., the new NOMMA (New Orleans Military and Maritime Academy) team had a champion at 132 lbs. in Christian Chestnut. Bonnabel's Randell Ross won at 170 lbs. and Doyline's Christopher Inocencio took home the 182 lbs. title. NOMMA gets the award for the best looking new uniforms in a long, long while (photo left). More information will be available on this event later on the Louisiana Wrestling News. As mentioned previously, Hahnville's Nicholas Lirette avenged his 6-5 Louisiana Classic finals loss to Brother Martin's Stephen Rumney with a 10-9 win during a 71-6 dual meet loss to the Crusaders. Rummel gave Holy Cross a hard time, succumbing 36-30 in a match in which the Raiders forfeited to the Tigers' George Benoit. This was also the match in which Joe Kerry scored a fall over previously unbeaten (in Louisiana) Brice Duhe. Rummel's Blake Mateau solidified his #2 seed at State with a 3-0 win over Chris Zea, but the Tigers got one back when Jeffery Argrave avenged a November 15th 7-5 loss to Robert Fairchild with a 3-1 decision. Fairchild, though, retains a higher seed as his win was in a tournament setting (the Mandeville Open). Taking nothing away from the competitors at the 2015 Greater New Orleans Championships, it must be said that once again a great opportunity for this to be a very prestigious event has been squandered. Not since 2005 have New Orleans area teams dominated the wrestling landscape as they do this season. Twenty of the 28 Louisiana Classic finalists, and 30 of the 56 1st-4th placers, were from the New Orleans area. In tournament competition Brother Martin, Holy Cross and Jesuit have proved to be the top three programs, and top contenders can be found at Fontainebleau, Hahnville, Mandeville, Shaw and St. Paul's. This event was a full month before the state championships and thus it is too early in the season to start protecting seeding positions. Baton Rouge area schools, Lafayette area schools and Shreveport/Bossier area schools all have championships that are hotly contested. That the New Orleans area cannot produce a stellar tournament at least once a year is beyond baffling. Holy Cross's 106 lbs. champion Chris Zea dominates a table at the GNO Championships. In the spirit of "You don't get one of these hoodies if you don't show up," fourteen GNO champions were crowned Saturday at Holy Cross. The Tigers came away with eight of them and won the team title with 304.5 points. The second place Jesuit Blue Jays won five titles and Chalmette came away with one. For the Tigers: Chris Zea defeated a scrappy Adam Larriviere of Jesuit 10-5 to win at 106 lbs. ; Jeffery Argrave followed with a great 9-7 SV win over Thomas Jefferson's Logan Griffin at 113 lbs. ; Dylan Soileau won his second tournament of the year 13-2 over Jesuit's Payton Markey at 126 lbs. ; Cole Clement knocked off Jesuit's Max Grosch at 132 lbs. 9-4; George Benoit remained undefeated at 152 lbs. with a 3-1 win over John Ehret's Jack Fontenot; Preston Robichaux defeated teammate Parker Wilkins in an all-Tiger 160 lbs. final; Brice Duhe had three falls in winning a round-robin bracket at 170 lbs., as did Travis Gardener at 285 lbs., although his three matches only lasted a combined 2:21. The Blue Jays had winners in Joseph Dupre (120 lbs. ), Jake Rovira (138 lbs. ), Griffin Mason (145 lbs. ), Dylan Daboval (182 lbs.) and Guy Patron, Jr. (195 lbs.). For the Chalmette Owls it was Avery Cox taking first place in a round-robin bracket with three first round falls. The Teurlings Catholic Rebels proved that they are the team to beat in the Lafayette area in a tournament format also, scoring 255.5 points for a 54.5 win over runner-up Comeaux at the Teurlings Rebel Open. The Rebels previously won the Greg Lavergne Lafayette Parish Duals championship on January 9th and 10th. Josh Hebert (113 lbs. ), Brock Bonin (132 lbs. ), Tristan Lee (138 lbs. ), Dante Hebert (145 lbs. ), Dakota Hebert (152 lbs.) and Kynan Sonnier (170 lbs.) won championships for the Rebels. Comeaux had three champions in Hunter Fitch (126 lbs. ), Kole Miller (160 lbs.) and Calvin Griffin (195 lbs.). Earning the other titles were Sulphur's Kiefer Fuselier (106 lbs. ), Christopher Marson of Denham Springs (120 lbs. ), Dunham's Grant Rabel (182 lbs.) and Mason Rabel (220 lbs.) and Northside's O'Shea Dugas (285 lbs.). This was Dugas' first event since the Jacob McMillan on December 20th, and he remains unbeaten and top-ranked statewide at 285 lbs. Marson picked up his first tournament win since 2013, the season in which he was an undefeated sophomore until he suffered a season ending injury at the Louisiana Classic which kept him out for the entire 2013-14 season. Scoring 24¹ points against Brother Martin is an accomplishment few teams can boast of this season. Saturday, however, it took the combined efforts of four teams to score that many points as the Crusaders obliterated the 16-team competition at the Live Oak Duals. In pool competition they beat East Ascension 73-4. Fontainebleau 57-10 and St. Amant 60-3. In the first place pool winner's brackets they defeated Zachary 67-3 and then crushed Rummel 70-4 in the finals. The Rummel score has some qualifications attached to it. The Raiders forfeited five matches as they did not have the services of Josh Ramirez, Matthew Bowman or Ryan Hanley during the event. They did have Dylan Hezeau at 132 lbs., but chose not to pit him against Paul Klein. Yet they also had Robert Hudgins available at 220 lbs. but held him out against the Crusader's Jacob Clapp. That may easily have been the result of an injury, but whatever the reason was it sets up a crucial match between Hudgins and Clapp on February 4th, possibly with a #2 seed at State on the line. Zachary's Sam Johnson received his first dose of Brother Martin's Mason Williams in a 7-1 loss. Johnson should be a significant factor at the state championships at 145 lbs., where all things point to a semi-finals rematch with Williams. For those who do not know it, Johnson was a second seed in Michigan's Division II state championships last year, yet suffered a head injury in his first match which prevented him from placing. In that, his sophomore year, he lost all of two matches. There is no question in that the young man has "game." Moving up to 152 lbs. in Zachary's match against Parkway, he defeated defending Division II state champion Zach Funderburk 8-1. The Fontainebleau Bulldogs reigned supreme in the 27-team field at the Rayne Open on January 17th. Fontainebleau scored 236 points, outdistancing second place McKinley by 53.5 points and host Rayne by 89 points. Gabe Peterson (113 lbs. ), Brandon Verges (182 lbs.) and Ethan Eisenhardt (220 lbs.) won championships for the Bulldogs, who also had runners-up in Jamison Willie (120 lbs. ), Chad Boudoin (160 lbs.) and Roland Landry (170 lbs.). Eisenhardt remained undefeated on the season, a streak that continued throughout Saturday's Live Oak Duals when he defeated both Louisiana Classic finalists. Host Rayne had two champions: Cooper Simon garnered the title at 106 lbs. and Andrew Arceneaux did the same at 195 lbs. The remaining nine weight classes were won by wrestlers from nine different schools: Charles Hudson of Comeaux at 120 lbs., Matthew Matherne of Ouachita Christian at 126 lbs., Andrew Aucoin of Sam Houston at 132 lbs., De'Quint Gie of McKinley at 138 lbs., Gavin Cortez of Basile at 145 lbs., Trae Case of Kaplan at 152 lbs., Damian Lasseigne of Lafayette at 160 lbs., Eric Duhon, Jr. of Acadiana at 170lbs. and Aaron Tanner of St. Louis at 285 lbs. J.J. Lawson noticed an interesting fact re the Live Oak Duals - the teams in Pool B, Brother Martin, Fontainebleau, St. Amant and East Ascension, each won their brackets after the pools were completed. Brother Martin won the championship title, of course. But Fontainebleau won the bracket of second-place finishers, St. Amant the bracket of third-place finishers and East Ascension the bracket of fourth-place finishers. Competing with the Crusaders (as in just getting the drubbing over with early) seems to have its benefits. ¹ The original tally listed at 21 was incorrect as St. Amant scored three points against the Crusaders that were not listed on the TrackWrestling brackets or team results.